A month ago I wrote a post “World Without Wires” about the unique material developed by Japanese scientists that can transmit electrical energy to nearby devices without the need for direct contact. Now in today’s issue of Science magazine, an MIT research team led by Prof. Marin Soljacic reported its version of the “world without wires” – “Wireless Power Transfer via Strongly Coupled Magnetic Resonances“. 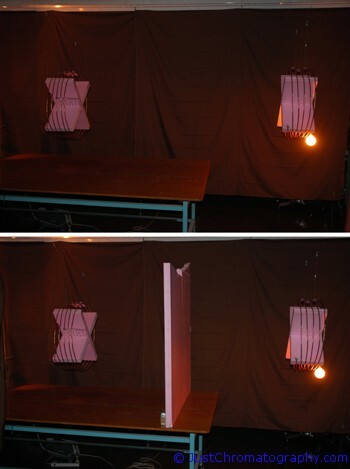 The team was able to wirelessly transfer power to a 60W light bulb from 7 feet away with 40% efficiency but unlike the Japanese method, it neither involves the pentacene based organic transistors, nor the magnetic induction. The most known method of the wireless power transfer is electromagnetic radiation (radio waves); however, the efficiency of this method is extremely low because the radiation spreads omnidirectionally and the majority of power is wasted in space. But the directional or laser approach is not acceptable solution either, since it would require an uninterrupted line of sight between the source and the device, and it can be potentially harmful. In the 1910s, Nikola Tesla dedicated a lot of time attempting to create a system that could transfer power wirelessly; however, the large coils that he used in his experiments emitted very strong electromagnetic fields and hence could not find practical applications. The MIT research team’s newly proposed method, which they refer to as “WiTricity”, is based on a near-field magnetic resonance principle – where two resonant objects of the same resonant frequency tend to exchange energy efficiently, while interacting weakly with extraneous none-resonant objects. A good trivial example of the acoustic resonance coupled system is a room with 100 wine glasses filled to various levels, and hence, having different resonance frequencies. If an opera singer sings a note with the frequency that matches one of the glasses, then only that glass will resonate and could potentially explode if she sings powerful enough without affecting the rest. Soljacic’s team investigated a system of two electromagnetic resonators coupled through their magnetic fields – two copper coils: one coil attached to the power source that emits non-radiative magnetic field oscillating at MHz frequencies, and the other receiving unit that resonates in the field. It turned out that the strongly coupled regime in this system is achieved when the distance between the coils was several times larger than their sizes. At first glance, such a power transfer is reminiscent of the usual magnetic induction; however, note that the common non-resonant induction is extremely inefficient for mid-range applications where the efficiency drops to 1 millionth. The resonant nature of the process ensures the strong interaction between the sending unit and the receiving unit, while the interaction with the rest of the environment is weak. With this design, power transfer has a limited range, and the range would be shorter for smaller-size receivers. Still, 13″ coils are capable to sufficiently power a laptop and can transfer electricity over room-sized distances nearly omnidirectionally and efficiently, irrespective of the geometry of the surrounding space, even when objects completely obstruct the line-of-sight between the two coils. Sir i am a prefinal year engineering student i had just know know about ur project and i had also a basic idea about the usage of microwaves for the long distance power transmission would u guide me for that…. if any 1 of you have recearch paper plz send me on this address. i didnt quite understand this term : “standard Colpitts oscillator with inductive element in a single loop of copper wire 25cm in radius”..does it mean that the inductor used in the colpitt’s oscillator is a single loop of wire 25cm in radius??? i calculated the inductance for such a case n it turned out to be impractical!!! plz help me with the design ofthe colpitt oscillator!!! i need circuit diagram of witricity along with discription of capacitor used. could you please mail me. am really impressed by your work…..i am working on it at be level …..i dint have vacuum tube oscillator…………….so am doing with simple LC oscillator…and generating 1m Hz frequency receiving power about fraction at recipient coil …..i am able to glow led of it……..wt u suggest? i want to implement the theory of witricity for my enginearing project.so please give me basic concept and circuit diagram. i want to implement “witricity(strong copling induction method) in my home ,so you give basic concet & circuit diagram . i am an engineering student from vadodara, india. witricity, being my dream project i want to know the fundamentals behind it. actually i was quite shocked when i read the news about the concerned topic for the first time in times of india. i had this idea before that and i thought that i m the first to think about it. i m very happy to find that it is the very recent research topic and i m thinking on the same. it is good that MIT has sucessfuly achived the aim. but i even think of transmitting the power wirelessly to far distances. but being the first year engineering student i have lack of guidance and proper knowledge. i need some one who can guide me in the concerned topic for my further research. with this advance technology we can see the chainging era with in our generation.Just imagine world without wires is how beautiful and as an interested person in new technologies i wanna see this very soon. do you at least know how this works? resonance is important only on transmitter, because if nothing eats its energy transmitter can take it back from magnetic field. however without use of superconductor coil this is doomed to have terrible losses. receiver can be any resistive loop or any non ideal conductor material, so this will heat human body as well. and you risk to damage sensitive electronic equipment if you move it to close to the transmitter. Hello people ! Something old & good foret . In this Word there were only 2 persons, original persons : Leonardo Davince & Nicola Tesla . Second one made resonance , transmitted true energy of electricity by long distance, not a few feet . May be it is better than we don’t know how he got it , maybe, because in material world yet there are animals like Hitler & Stalin . aren’t bush and palin worse? Yes you could create witricity at home but you would need something that makes oscillating currents in 9-10MHz range. They used a “standard Colpitts oscillator with inductive element in a single loop of copper wire 25cm in radius” and this coil was inductively coupled (like a transformer) with the transmitting self-resonant copper coil. On the other end is the same setup in reverse: a receiving self-resonant copper coil and next to it an insulated wire loop with an attached light-bulb (see the picture, there is the insulated wire with the light-bulb). I think the biggest challenge is to make the coils resonate. You will have to calculated the proper geometry using the formulas they give in the paper. I want to know if it is possible to build one of these. I see the pictures and it doesnt look like it takes anything extremely expensive. What is used to create the resonance? What a fascinating technology. Wireless internet and phones are one thing but being able to transmit electricity wirelessly could be a major breakthrough. Thanks for keeping us posted on this. The mathematical models and the experiments were limited to only two self-resonant coils. But theoretically any number of objects can participate in “strong coupling” as long as they are on resonance. “Would a heavy load on one �??receiver�?? pull down the others?” – I don’t think so because for each “source< ->device” coupling there is a finite maximum of power transfer that depends on the geometry and size of the source and the receiving coils. Appreciate the work you folks are doing. I work for WKEB/WIGM Radio in Medford, WI Paul Harvey had the story on today about the WiTricity and I am currently builiding a new home. Being a do it yourself kind of guy, this story immediately caught my interest. The thoughts of no wire’s in your home for electricty excited me. Unfortunately it seems to be a way off from production. I love the concept looks like it could be practical… of course it must be a good range for usability and a short enought range so the neighbor can’t swipe your power. Keep up the hard work. Ed, actually I am not so glad anymore that I did this story. It is all over the net and every news agency is covering it. I like more unique stories that don’t get such forced publicity. Yes, you are right, the research paper is riddled with the math equations and I had a really hard time with them. As far as the importance of this work… well it is still too early to say anything for sure. They experimentally proved their theory and were able to get decent results but the 40% efficiency is very low. The Japaneses work was at >80% and frankly I like their solution a lot more – very elegant indeed. You know, I was going to write up this story but I’m glad I didn’t because (a) you did a much better job, and (b) the equations in the paper make me twitch. So (and I have no bearing on this), how important and practical do you think this actually is?